It was a big celebration Friday afternoon when T & T Scientific showed-off its new digs in a building that formerly housed Regal Entertainment’s Real Estate and Architecture Department. Roughly a month ago, the local start-up purchased one of the seven buildings Regal vacated when it moved downtown and moved into the 15,000 square foot, two-story structure. One could say correctly that T & T Scientific has enjoyed a hockey stick-type growth, considering its first product – the world’s first single-use and fully assembled liposome extrusion system – was introduced in March 2016. The Halls facility is the third location for the company, having started in a room adjacent to the kitchen of Co-Founder Nima Tamaddoni’s apartment. 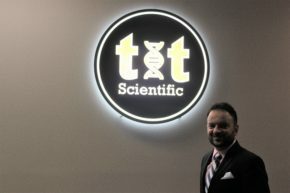 While the space seems massive for the start-up, Graham Taylor, the other Co-Founder, says T & T Scientific expects to outgrow the building within two years. What’s fueling the growth for the winner of the “Traction Award” at the 2018 “Startup Day Knoxville”? It is contract R&D and manufacturing for other companies along with T & T Scientific’s analytical laboratory and services where the company performs tests on drug formulations and submits reports to the customer. “It was our international reputation,” Tamaddoni says in relation to the contract manufacturing work. Noting that “people are using liposomes for all kinds of things,” Taylor said T & T Scientific’s has contracts with companies in the pharmaceuticals and nutraceuticals markets. The work covers a broad range of areas – from cancer drugs to vaccines and tissue engineering. Friday’s reception was held in a large space that will soon be transformed into clean rooms. There are various classifications. In T & T Scientific’s case, it plans to have ISO Class 7 clean rooms for nonhazardous and hazardous materials in addition to an ISO Class 5 sterile processing area. The goal is to have those operational and validated as quickly as possible. For the Co-Founders, it has clearly been almost meteoric growth.